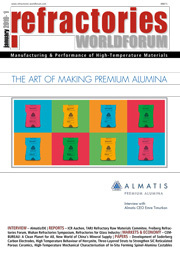 refractories WORLDFORUM is the new technical and scientific journal for the entire refractories sector: production, application and further development of high-temperature materials. 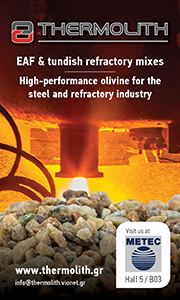 refractories WORLDFORUM addresses refractories professionals worldwide, i.e. in the production of refractories as well as in industries processing and consuming refractories, suppliers (raw materials and additives) and plant and machine engineers. Each issue also features market analyses of selected countries, company profiles and interviews with manufacturers and suppliers, reports on new and upgraded plants as well as giving a survey of the sector (news items on companies, people, products, events). refractories WORLDFORUM builds a bridge between industry and science. The editorial staff is supported by international members of the industrial and scientific editorial board (Chairman: Prof. Dr. C.G. Aneziris).